Auntie Genoa Keawe performed during a memorial service for the late Sen. Hiram Fong in the state Capitol atrium in August. » Auntie Genoa Keawe has played at the Waikiki Beach Marriott Resort & Spa for 11 years. A Page A3 article Monday incorrectly said she has played there for more than 20 years. Also, she quit school after the eighth grade and started her recording career with 49th State Records. The article incorrectly said she began with Hula Records. Before she made it as a singer who toured the world as a Hawaii legend, Auntie Genoa Keawe sold leis and drove taxicabs. At 86, Keawe still draws huge crowds every Thursday night when she performs at the Waikiki Beach Marriott Resort and Spa, where she has played for more than 20 years. Local musicians say they often drop by the Marriott to hear her signature falsetto voice and admire her ability to still hold a high note for more than two minutes. She is also quick to bring fellow entertainers up on stage. The University of Hawaii announced recently that it has approved a request from Kapiolani Community College to confer an honorary degree on Keawe in recognition of her "national stature and musical achievements." The sole living member of the Hawaiian Music Hall of Fame, Keawe has received many awards, including multiple Na Hoku Hanohano awards. In addition to more than 60 years of entertaining and more than 50 years of recording, she has been an instructor in ukulele workshops as part of the Windward Community College Hawaii Music Institute. Her degree will be conferred in May at Windward's 2005 commencement. "Auntie Genoa has been in the forefront of promoting Hawaiian music as a performer and continues to share her music as a professional entertainer," said UH Board of Regents Chairwoman Patricia Lee. Van Horn Diamond, a fellow musician, said: "She's a musician's musician and a singer's singer. Everyone has high regard for her music and style." Speaking of her signature ability to hold high notes in songs such as "Alika," Diamond said: "People always try to copy her -- and imitation is a compliment -- but no one has the lung to do it." Diamond spoke fondly of how Keawe encourages young singers and helps them find the right style and lyrics. "She has just a huge repertoire of songs and will suddenly pop on out," Diamond said. "She's gentle but also firm. If someone is not doing the right chord, she lets you know, and that's the sign of a good performer." Born in 1918 in a stable in Kakaako, Keawe learned singing when she moved to Laie as a young child and joined the Mormon church's choir. Quitting school in the eighth grade, Keawe was 16 when she married her husband, Edward. Together they had 12 children, about 35 grandchildren, more than 50 great-grandchildren and more than a dozen great-great grandchildren. Keawe learned to speak Hawaiian from her mother-in-law, who spoke it as her first language. 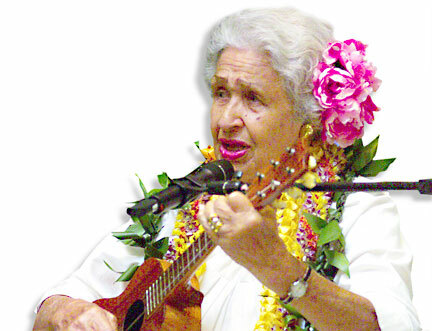 Music critics have noted that Keawe, who like many of her generation plays her music by ear, has perhaps the widest repertoire of traditional Hawaiian songs of her peers. Some have likened her bell-like falsetto to yodeling Hawaiian style. Just before World War II, she began singing at the Officers Club and for bandstand shows in Kailua. On a dare one day, she sang "Happy Birthday" to her niece on the radio. That started her 1940s radio career on KULA and KGU radio. In 1946 she began her recording career with Hula Records, and later started her own label, Genoa Keawe Records. When she was not touring the world from Russia to Japan, Keawe often played six nights a week in Waikiki lounges and hotels. "Auntie Genoa is a Hawaiian treasure, dedicating her life to preserving and perpetuating the Hawaiian culture," said Jeff Tyler, director of restaurant and banquet services at the Waikiki Beach Marriott. Tyler said Keawe has touched "everyone with her exuberant, high-energy Hawaiian falsetto."